Vacuum-insulated piping systems produced out of stainless steel for the transport of cryogenic liquefied gases like nitrogen, oxygen and argon. 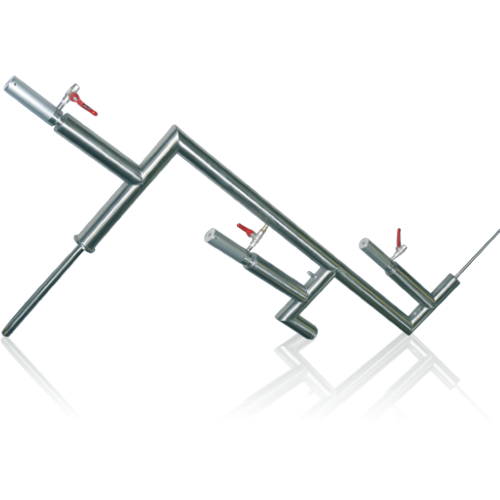 The piping systems are produced as rigid and as flexible sections as well. Expansion joints installed in the inner piping serve for compensating the thermal expansion between the vacuum shell and the media pipe. Low-thermal transportation supports between the external and internal pipes are used to minimize the penetration of heat. The individual sections of the piping system get connected to each other by means of flanged couplings and clamping rings. On special request the connections can be provided as welded couplings. A combined vacuum and safety valve is provided for every vacuum. This valve protects the external pipe against excessively high pressure and guarantees after the installation of a vacuum sluice the setting-up of a vacuum respectively its reconstruction in case of a repair. Active adsorption medium is provided at the media pipe for keeping the long-term vacuum.